Ana Gonzalez (left) spoke with Anne Hayes. The Trinity Boston Foundation conducts anti-racism training. Twenty coworkers gathered in the basement of Trinity Church in Copley Square this month for a blunt discussion about racism in their workplace. The question on the table: How does the “culture of white supremacy” show up in their organization? Not the Ku Klux Klan, said Rebecca Jackson, a social worker on staff who helped lead the session. Rather, she said, the subtle habits and values that tend to keep white people comfortable and in charge — and people of color at the margins. Then, the group did something even more radical: They separated themselves by race to talk more — white people in one room, people of color in another. 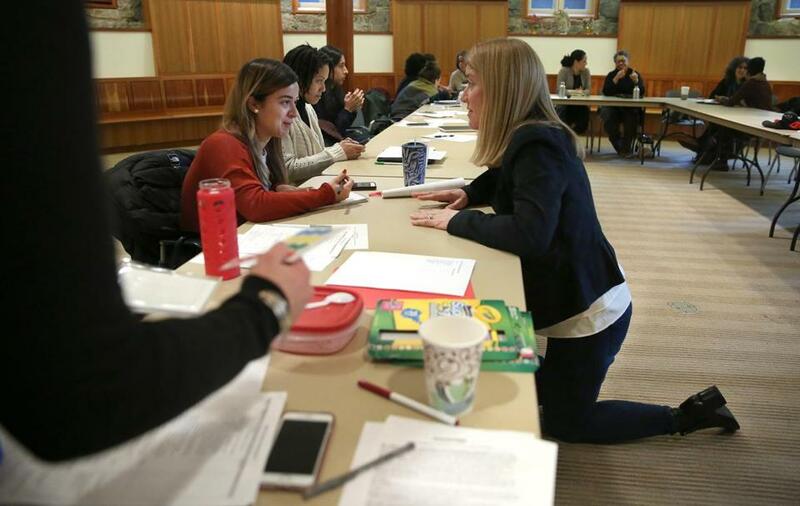 Racially segregated meetings to discuss race, sometimes called “caucuses,” have become a regular practice at the Trinity Boston Foundation, the nonprofit social service arm of Trinity Church. It’s one tactic the staff has embraced as they’ve sought to confront racism, as individuals and as an institution. But at a moment when race relations seem to be at a crossroads — will America more widely embrace diversity, or become more divided and embittered? — many religious and nonprofit organizations, companies, and communities, including the City of Boston, are venturing into conversations about race that extend beyond the occasional human resources-mandated hour of diversity training. The Trinity Boston Foundation, which supports counseling and mentorship programs for middle and high school students in the city, is a subsidiary of Trinity Church, the historic Copley Square behemoth that has long been a spiritual mainstay of the Back Bay. Trinity’s parishioners— who volunteer in the schools that the foundation assists and contribute about one-fourth of the foundation’s $2.4 million-a-year budget — have separately been engaged for two decades in efforts to combat racism. The foundation’s work on race intensified after the 2012 shooting of Trayvon Martin, an unarmed black 17-year-old from Florida. The case powerfully affected Jackson, who joined the foundation in 2012; Martin could have been one of the black teenagers she’d worked with at her last job in a Roxbury police station. She knew the young people whom she and her coworkers saw every day would need support. They organized a community vigil. In time, the staff started basic internal training on racism. It was a recognition that, in a city whose schools are 86 percent students of color, and where systemic racism remains a major cause of inequality, “working against racism . . . is at the heart, the center of the problems we’re looking to try to address,” Jackson said. That learning was crucial, many staff felt, for a white-led organization such as the foundation. It has since become more diverse, but at the time, the staff, foundation board, and executive team were largely white. In 2014, Michael Brown was killed in Ferguson, Mo. The foundation held evening discussion circles, and at brownbag lunches, the staff talked about police violence, protests, and other news events. That fall, Packard and her staff said, a hastily arranged effort by Packard to bring the board into the conversation ended badly. Black staff members were asked to describe painful experiences with racism to the board, a room full of mostly white, male strangers. The format broke down as some board members talked over the moderator, and misunderstandings flew. The staff who participated felt bruised. But they worked through the hurt feelings. The board has become more conversant in the role of race in the foundation’s community work, staff say, and more attuned to an increasingly sophisticated national conversation on the subject. The foundation staff tried caucusing a few years ago, after reading an article about it. Many corporations and other organizations have support or “affinity” groups for gay or minority coworkers. But caucusing asks the majority to participate, too — to notice unfairness, and to work for change. In the last eight months, it has become a regular practice, alongside conversations about race in integrated settings. Each caucus meets twice a month. Attendance is voluntary. It’s confidential, but the leaders of each caucus — Jackson, who is black, and Alicia Ridenour, who is white — meet regularly to debrief Packard on issues that emerge. Initially, some found it awkward. But Hayes said she has come to see value in the practice. White caucus members teach one another about what, for example, might constitute a “microaggression” — a subtle racial insult that, when combined with a lifetime of such remarks, can cause serious damage. The whites-only environment can lead to more productive conversations by minimizing embarrassment and the risk of hurting colleagues of color. “We can learn things on our own, without putting pressure on people of color to teach us,” she said. Hayes said she has called a close friend, a woman of color she met in business school, to apologize for insensitive things she remembers saying years ago. She recalls, for example, searching for explanations other than racism for her friend’s stories of her brother constantly being stopped by police in their upscale neighborhood, and of not being able to hail a taxi in New York. “I find ways to become a better ally, even if it’s as simple as listening to stories like that and saying, ‘That must have been really hard,’ instead of, “Are you sure the person meant that?’ ” she said. People of color on staff say the caucus meetings offer support and healing from the racism they encounter, especially in the course of their work in the community. It’s also a chance to consider how they may have unconsciously internalized a sense of inferiority. Blanca Valentin, a clinical manager at College Bound Dorchester, said she appreciates the nodding around the circle when she relates her experiences. And in a cultural environment in which racism isn’t always obvious, caucusing can help people analyze ambiguous situations. The foundation is beginning to share its anti-racism work; last September, the staff taught representatives from 20 or so Boston organizations about caucusing. Earlier this month, a training session began with an exercise. Twolarge sheets of paper hung on opposite sides of the room, each listing characteristics of “white supremacy culture.” Separately, whites and people of color were asked to put stickers beside the ones they noticed most often at the foundation. Many staffers in both groups flagged “sense of urgency” — unnecessarily rushed decision-making that, with a slower and more thoughtful approach, could be more inclusive. But many more staffers of color than whites put their stickers next to “right to comfort” — the notion that white people should not be made to feel uncomfortable. Caucusing began. In one room, Jackson asked the staffers of color to scoot their chairs in closer. Andrade mused over the groups’ different perceptions. She noted that the foundation’s sense of urgency seemed to taper when it came to having difficult conversations about race with Trinity Church and the foundation board, a majority of whose members are white. “It’s like we’re willing to examine the problem, but not dismantle it,” Andrade said. In the other room, the white caucus ruminated on the same question: Why did so many people of color still feel as if the foundation was laboring to protect white people’s feelings?